Starting to look half tidy again now,nice day for a ride too! Great work on this, looking really good! How do you rate the rear shock? Looking at one of these for mine but not sure if its worth the extra over the YSS Pro-X? It certainly looks nicer! Have you fitted Renthal grips? Cool, thinking of going for the renthal kevlars on mine as can get them in the larger 32mm size, though I like the grey ones better colour wise! Always reminds me of race bikes. Anyway they should take care of the little vibration I get through the original near solid grips!! Shock sounds good though odd it doesn't go that firm, guessing it's still harder than the original though? I'm planning on going the opposite route to you regarding premix.. currently I'm running autolube and premix - annoying, I want the simplicity filling up at petrol stations without messing around with oil at the pump. so the plan is to buy a new genuine pump with all new pipework and have the pump turned up a bit to make sure everything is safe. I figure my original pump has done a good job for 15k and 18 years so can't see why a new set up won't do the same again. Whats next on this project? Yeah the grips are comfy tbh. as for the auto lube if you get brand new you'll have no worries earthier way if you get new of premix it'll be fine. It's not so bad for me with oiling at pumps as I only fill up once every 2or3 weeks as I just use the bike as a pleasure thing so full tank lasts weeks lol. As for what's next iv got a few tasteful mods up my sleeve I'll be sure to post the pics. by the way your bikes very clean around the same year as mine I believe? Looks like your brake cable is stretched, or shoes are worn, or the back lever thingy is put on wrong? Its bolted on wrong then. What makes you think it's bolted on wrong.there's only one way it gos isn't there ? How would you have it bolted? if you could elaborate? What he means is there is far too much thread showing on the adjuster. Either the cable is the wrong one for the model or the lever is on the wrong splines. 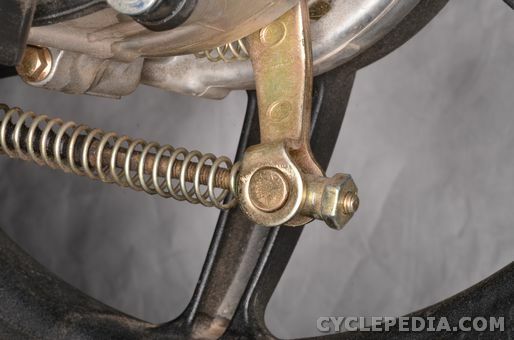 I don't know the model but usually you can unbolt the lever and move it back one or two splines so that the adjusting nut is nearer the end of the threads. As it stands it looks like you have little or no adjustment left as the shoes wear. It should look something like this with new shoes.